The Draw: Stylish and cozy at once, Rustique blends refined and rustic on the plate and in its décor. Much like Blowing Rock itself, Rustique blends quaint and comfortable with modern touches reflective of a growing, ever-changing community. This year-and-a-half-old establishment showcases young chef and owner Shayne Lewis’ already-diverse culinary experience, which includes a year in Paris at Le Cordon Bleu, stints cooking in Charleston and San Francisco, and co-running a restaurant in Charlotte. Whether you’re aiming for a glass of wine and elevated small plate snackery or settling in for a formal four-course meal, menu offerings range from fun and fanciful to rustic and refined. Rustique supplants the erstwhile Blowing Rock Grill, and the interior’s overhaul is notable with sun-bleached Indiana barn wood and plaster walls, hung with contemporary tone-on-tone barn paintings and oversize bold-lined portraits. The space feels fresh, open, and purposeful. A cozy nook at the picture window allows for a large group around a tall rough-hewn community table, while the bar is a focal point along which to dine, drink, or simply gather-round. Handsome leather and oak booths line the opposite wall, with a smattering of tables in between. The final esoteric touch, beyond low-hanging glass pendant lamps, is the glorious backdrop of a rough stone wine cave at the back of the dining room. A sliding barn-door closes off the anteroom for private occasions. The menu is thoughtfully addressed as well. Cocktails feature classics with a twist and more adventuresome beverages like the Smoked Maple Old-fashioned or gin-based Cucumber Cooler. The dinner menu offers salads, small plates, and entrées, with enough choice to pique one’s curiosity for subsequent visits but not so many listings as to overwhelm. The crunchy shaved brussels and apple salad resembles a slaw more than expected, but proves a toothsome mélange of sour, sweet (Granny Smiths and pickled onions), and savory, with candied-toasted sesame seed crunchies and a sesame vinaigrette. I’m enticed by the octopus grilled with heart of palm and gigante Mediterranean beans dressed with chorizo chimichurri, the mussels in a lemongrass-coconut curry broth, and the house-made gnocchi. Yet, I’m most curious about the avocado-crab toast, which features a hearty slice of dense, peasant-style bread, buttered and charred on the grill and piled high with a salad and lump crab. The hearty portion has to be attacked with knife and fork, lest the contents of the toast go cascading down one’s front. Again, Chef Lewis pleases with a great commingling of crunchy and creamy, sour, salty, and the sea. Admittedly not a big meat-eater, I’m still intrigued by Rustique’s carpaccio. Quite possibly the winning dish of the evening, the gorgeously plated seared paper-thin tenderloin appears like an unfolding blossom on the plate, all dotted with dibs and dabs of lemon-pepper aioli, pickled celery, shaved Parmesan, and something called balsamic balls (balsamic vinegar reduced to its very essence, which bursts on the tongue with intensity), all finished with a flourish of olive oil and basil seeds. It’s simply beautiful, and a perfect dish for sharing. Between bites of the proffered basket of warm chipotle-cheddar bread and crusty sourdough, the dish is quite filling. And the small touch of a tiny butter dish surrounded with an infused salt rim and a swirl of olive oil speaks volumes: Rustique delights in the details. Entrées include pasta dishes such as spaghetti alla Gricia with pancetta, rock shrimp, mussels, chili, and pecorino; a hearty beer-brined pork chop with sorghum-sage demi-glace; filet mignon; and chicken Milanese with a lemon-caper brown butter sauce. Scallops over coconut-lemongrass risotto, wilted greens, and vanilla-soy butter are hard to refuse. But my App State student server convinces me that the potato pretzel-encrusted trout is all that. And it is. Rather than rustic peasant fare, this is a dish of refinement. 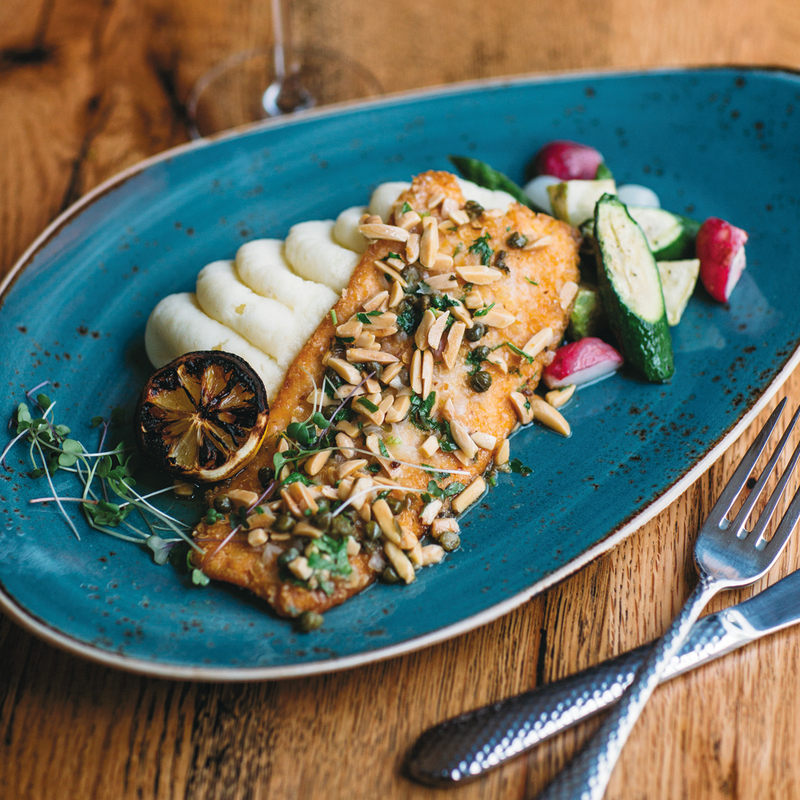 Scattered with micro-greens and toasted almond slivers, the fillet lies atop an elegantly piped potato-celery root mash, with a side of delicate baby vegetables. Tiny parsnips, baby carrots, and teeny patty pan squash halves pair delicately and perfectly with the trout. Their sweetness foils the overly salted dish (its only negative). A classic lemon-parsley butter sauce is at once rich and bracingly tangy, showcasing Chef Lewis’s French culinary training.